The idea for smoked pumpkin soup came to me when I was thinking about Halloween barbecue recipes and I have to say that my idea was met with serious derision from my wife. Halloween and pumpkins are synonymous and to my mind soup is the best way to use a pumpkin but my wife hates it, so you can understand why the idea of smoked pumpkin soup didn’t appeal. 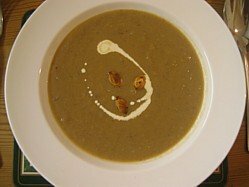 On the day that I first made this pumpkin soup recipe we had some friends coming round for dinner and I thought that it would be the perfect opportunity to get some objective feedback. You know what I mean, give everyone a spoon, let them have a taste and wait for the “polite” feedback – they emptied the whole pan full with cries of 10 out of 10! Even my wife enjoyed it. Smoking the pumpkin gives it a beautiful sweetness and a bit of apple complements it beautifully so give it a whirl, even if you don’t like pumpkin soup. You’ll see from the pictures that I used a whole pumpkin but if you do just want to use the scooped flesh out of your kids Halloween lantern the give it a go by all means. Just pop it in the smoker on an oven tray and you’ll get the same result. 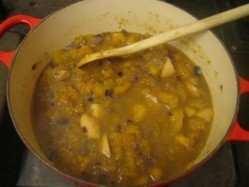 There's no allergens in this recipe but if using a stock cube then check the ingredients because many stock cubes contain gluten. 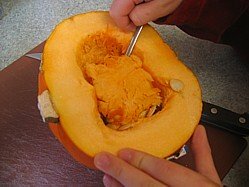 Slice your pumpkin in half and scoop out the seeds and “stringy” centre. Separate the seeds from the stringy stuff and place them in an oven tray, quarter the pumpkin and place both the pumpkin and the seeds in the smoker for 90 minutes at 150°C / 300°F. Chop the onion and garlic and fry in the soup pan with a splash of oil until the onion is translucent. When you’ve finished smoking allow the pumpkin quarters to cool and then spoon the flesh into the pan and generously cover the whole mix with vegetable stock. Bring it to the boil and let it simmer for 15 minutes. Using a hand held blender, blitz the soup until you have a lovely smooth liquid and then stir in the majority of the double cream. Depending on the strength of your stock you may need to add a little salt so do give it a taste. Serve out into bowls, spiral in a few of the remaining drops of cream and garnish with the smoked pumpkin seeds. This Halloween barbecue recipe is also wonderful just after Halloween because in cold rainy England we celebrate bonfire night on November 5th and this soup, served piping hot in a styrofoam cup warms the cockles of your heart. Lovely. Garnishing the smoked pumpkin soup with the seeds of the pumpkin isn't just about using all the fruit, there's evidence to suggest that pumpkin seeds help boost the levels of serotonin in the brain and so improve mood state... well I'm happy with that. For more on the nutritional benefits of pumpkin seeds use this link.